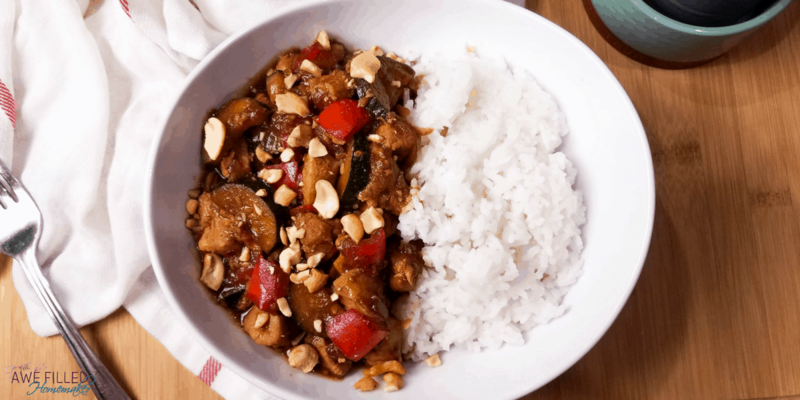 Kung Pao chicken is a popular dish in America. 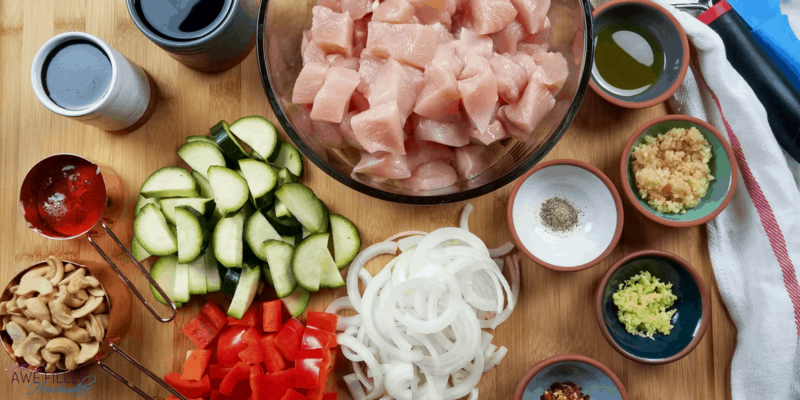 This dish arrived via Chinese immigrants and became a Chinese-American classic. 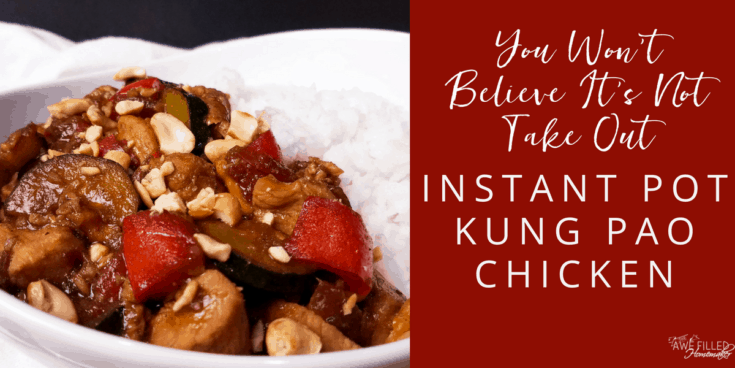 Kung Pao Chicken is a Sichuan classic that is still eaten in China today. 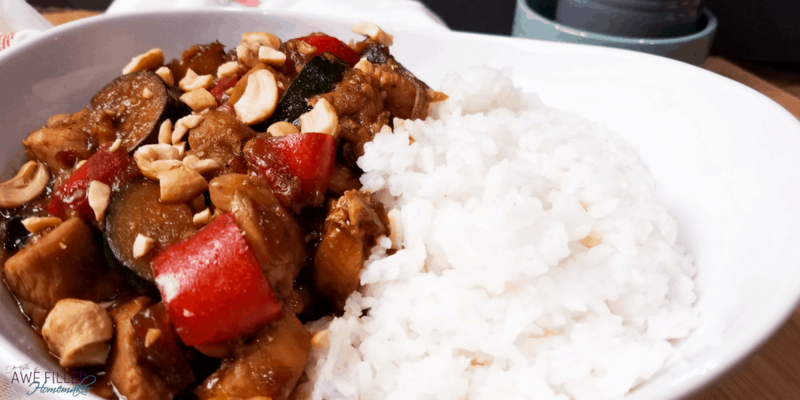 The Chinese-American dish is one of the most popular take out dishes and also one of the most popular dishes asked for in Chinese restaurants around the country. It is one of my very favorite meals to order when we eat Chinese food as a family. 1/2 cup low-sodium soy sauce OR make your own “faux” soy sauce if you can’t have soy or just want a healthier option. 1) Add the olive oil to the Instant Pot. When the oil is hot, add the onions, garlic, ginger, pepper, and red peppers. Gently sauté about a minute until fragrant. Add in the diced chicken and brown the chicken for 2-3 minutes. 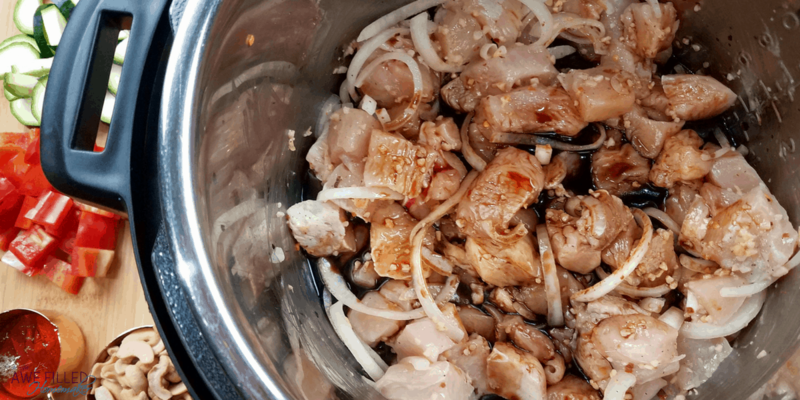 2) Mix in the soy sauce and hoisin sauce with the chicken. Close the lid and turn the venting valve to sealing. Cook the chicken on high pressure using the manual setting for 2 minutes. You do not need to add any addition water or broth because the chicken will produce its own juice. 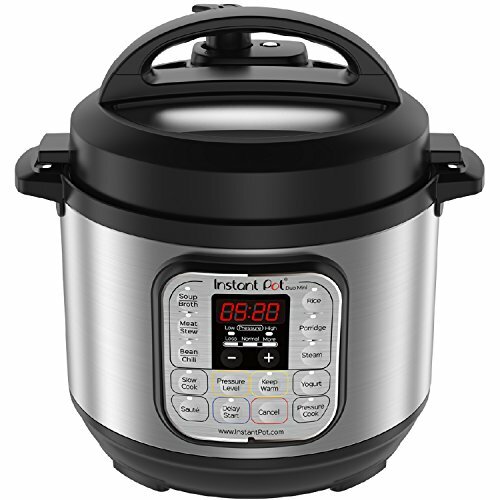 3) When the timer on the Instant Pot beeps that it is done release the pressure using the quick release method. Carefully open the lid and add in the bell peppers and zucchini. Close the lid and turn the pressure valve back to sealing. Cook on for an additional 2 minutes on high pressure using the manual setting. 4) After the 2 minutes are over release the pressure using the quick release method. 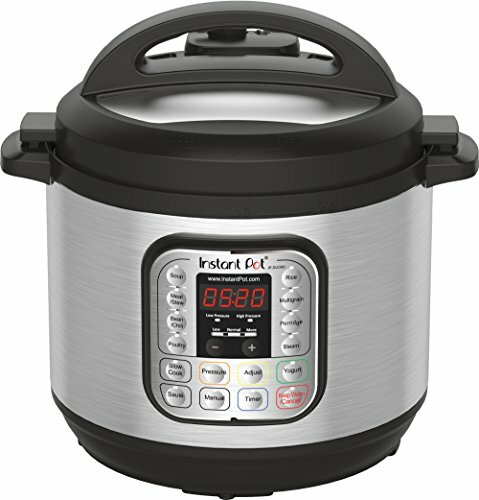 Remove the lid and switch the Instant Pot back to sauté. 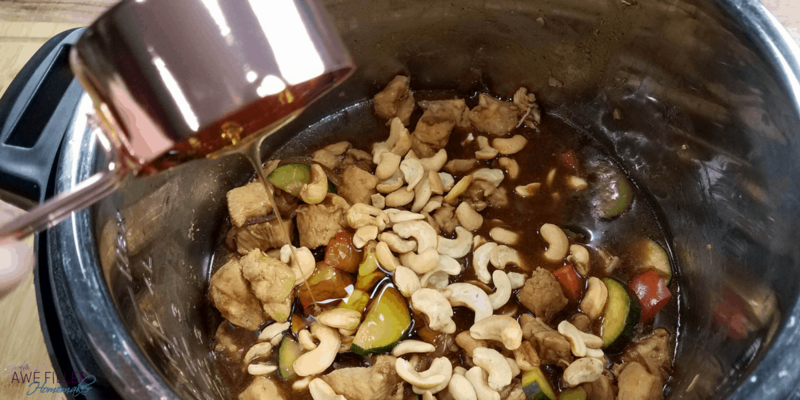 Stir in the honey and cashews. 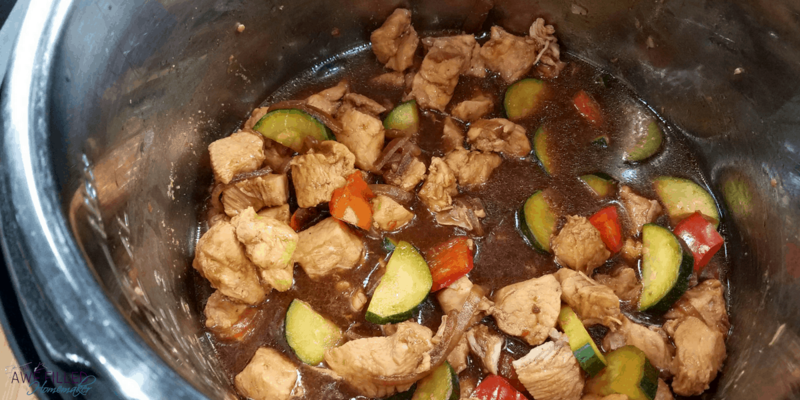 Make a slurry to thicken the sauce by whisking together 1/4 cup sauce with the rice flour. 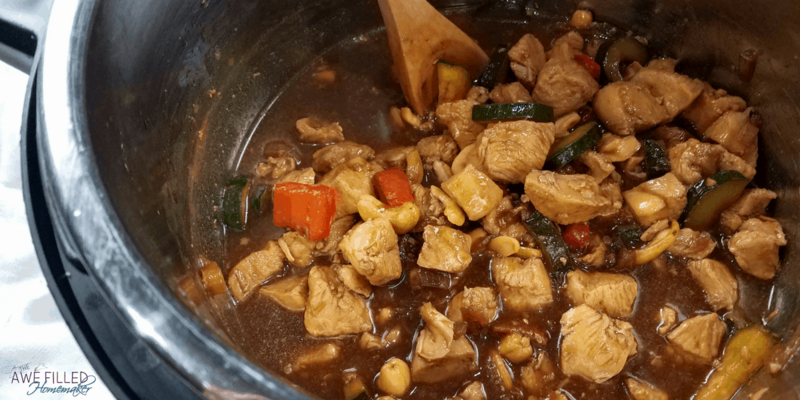 Then stir the slurry into the kung pao chicken and allowing the sauce to thicken. 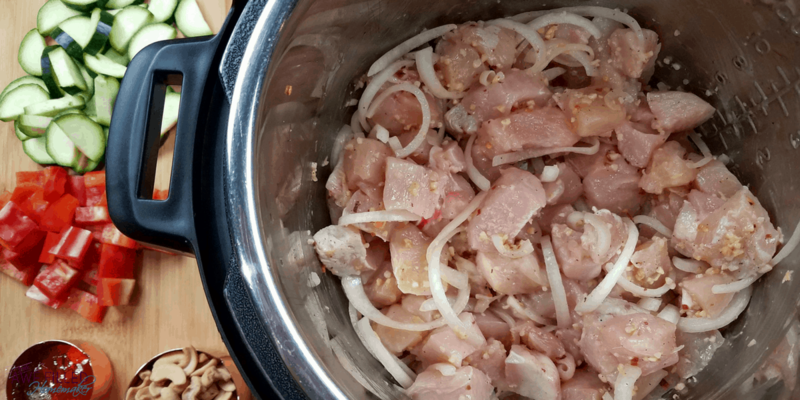 5) When the sauce has thickened to the desired consistency turn off the Instant Pot and serve. Garnish with more cashews and serve over rice, quinoa, or wrapped in the lettuce. Don’t Forget To Print Your Recipe For Later! 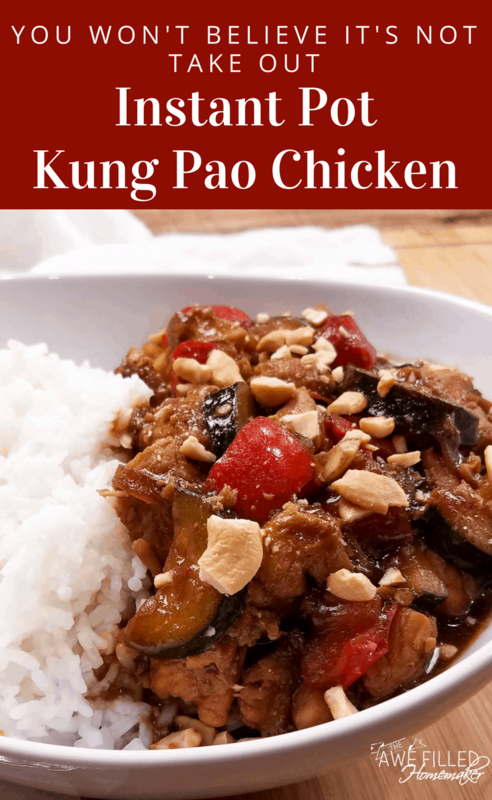 Kung Pao chicken is a popular dish in America. This dish arrived via Chinese immigrants and became a Chinese-American classic. 2 tsp thickening flour rice, tapioca, potato, etc. Add the olive oil to the Instant Pot. 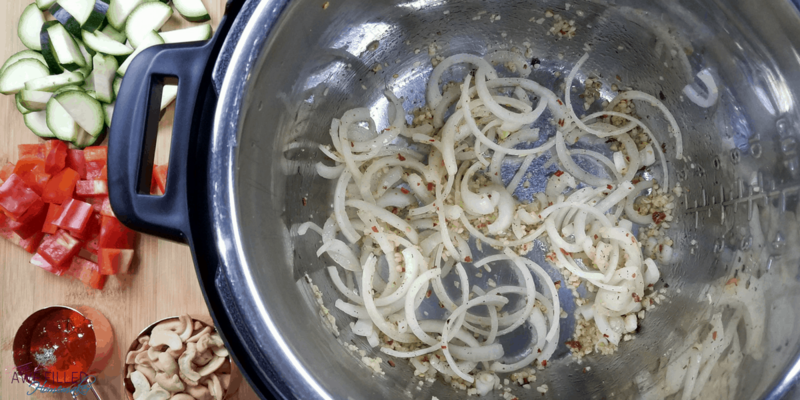 When the oil is hot, add the onions, garlic, ginger, pepper, and red peppers. Gently sauté about a minute until fragrant. 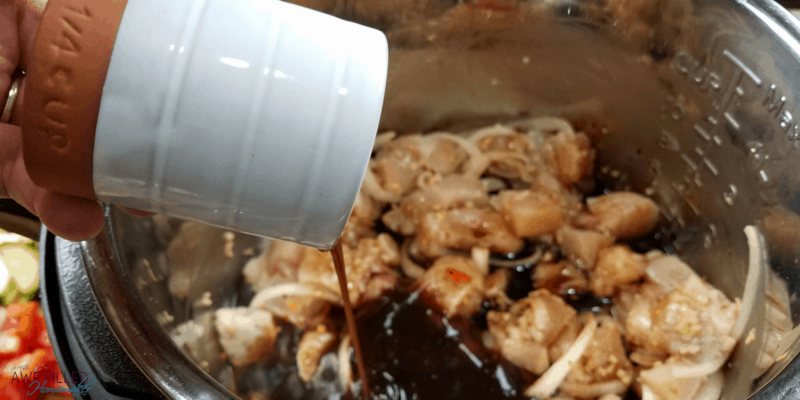 Mix in the soy sauce and hoisin sauce with the chicken. Close the lid and turn the venting valve to sealing. Cook the chicken on high pressure using the manual setting for 2 minutes. You do not need to add any addition water or broth because the chicken will produce its own juice. 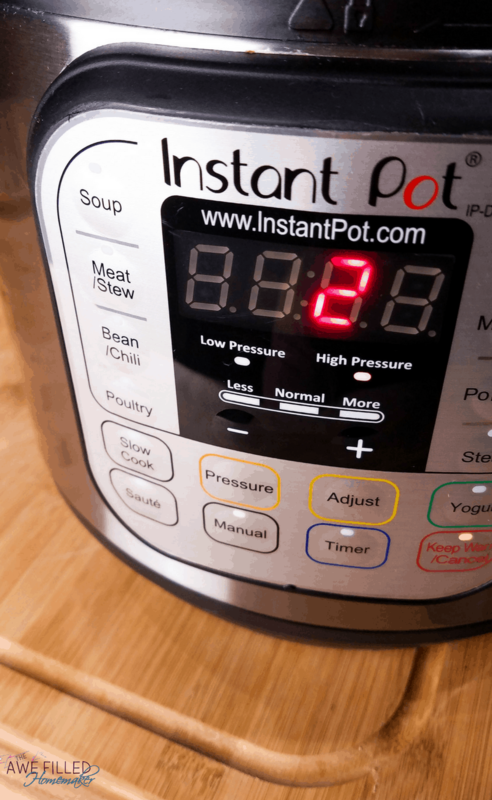 When the timer on the Instant Pot beeps that it is done release the pressure using the quick release method. Carefully open the lid and add in the bell peppers and zucchini. Close the lid and turn the pressure valve back to sealing. Cook on for an additional 2 minutes on high pressure using the manual setting. After the 2 minutes are over release the pressure using the quick release method. 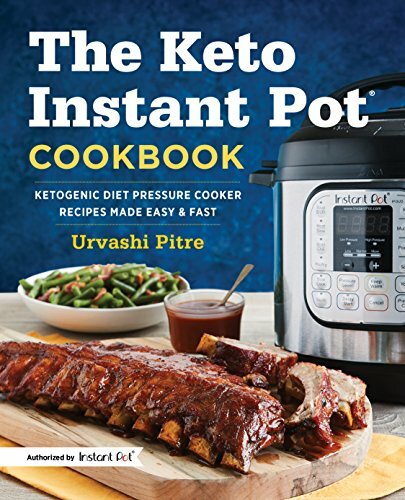 Remove the lid and switch the Instant Pot back to sauté. 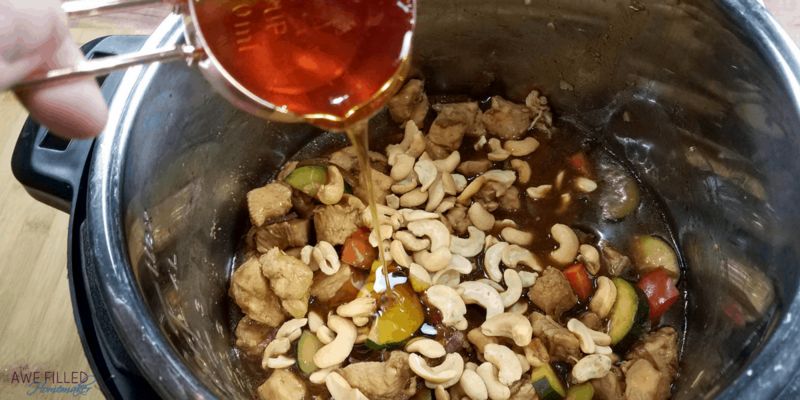 Stir in the honey and cashews. Make a slurry to thicken the sauce by whisking together 1/4 cup sauce with the rice flour. Then stir the slurry into the kung pao chicken and allowing the sauce to thicken. 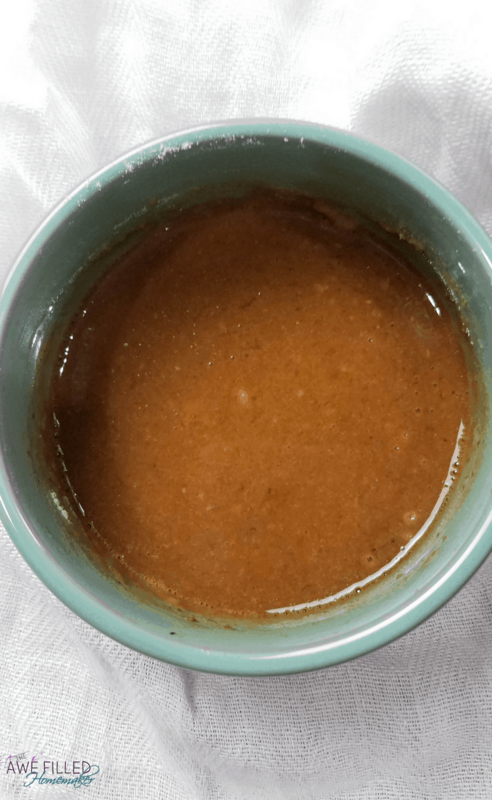 When the sauce has thickened to the desired consistency turn off the Instant Pot and serve. Garnish with more cashews and serve over rice, quinoa, or wrapped in the lettuce.